The Wild Hibiscus Flowers in Syrup are a show stopper and tasty, too. 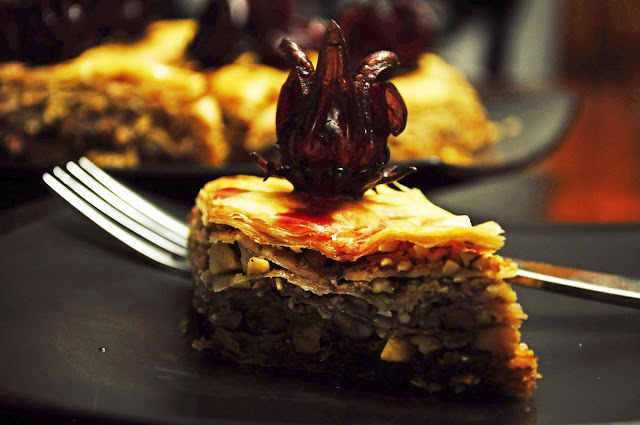 This is a basic Baklava recipe with the addition of Wild Hibiscus Syrup and garnished with Wild Hibiscus Flowers. You can use these beauties to elevate just about any dish or beverage. I can’t wait to impress my friends with some Wild Hibiscus Flowers in champagne. Gently strain and separate the flowers from the syrup. Reserve the flowers for garnish. In a small saucepan, combine the syrup, honey, water, lemon juice and sugar. On medium high heat, stir until the sugar dissolves and bring to a boil. Lower the heat to medium and let boil for 5 minutes more without stirring. Remove from heat and set aside to cool completely. Meanwhile, generously butter a 9 x 13 baking pan. Cut phyllo dough to fit the pan. I had to cut off about 1 inch because my dough was 9 x 14. Lay the phyllo dough on a flat clean surface and cover it with a damp towel. This keeps the phyllo from drying out. Remove 1 sheet of phyllo and place into the pan. Brush with some of the melted butter and repeat this process with 7 more sheets of phyllo, one at a time, brushing with butter. Be sure to keep the remaining phyllo under the damp towel at all times. Mix the nuts with the cinnamon . Sprinkle about 3/4 cup of the nut mixture evenly over the 8 layers of phyllo. Now start layering phyllo brushed with butter again using 4 sheets of phyllo, then another 3/4 cup of the nuts. 4 more sheets phyllo and 3/4 cup nuts. 4 more sheets of phyllo brushed with butter, 3/4 cup nuts. 4 more sheets buttered phyllo and 3/4 cup nuts. Then the layer the top with 8 more sheets of buttered phyllo. 2 1/4-inch strips lengthwise and then cutting diagonally across the pan to form diamonds. Bake in the oven 75 to 80 minutes, or until golden brown. Remove from the oven and immediately pour the cooled syrup evenly over the baklava. Allow to sit overnight or several hours to cool and absorb the syrup completely. Serve with wild hibiscus flowers. I have a wild hibiscus tree, and would love to try this recipe! The tree is on the edge of a ravine, and I could lose my life harvesting those flowers, but it's coming out of dormancy now and should be blooming soon!